The DVD business is lousy these days. Consumers are eschewing disks and downloading feature-length movies and TV programs in ever-growing numbers. That's why it's a perfect time to buy one of those portable DVD players you've always wanted. You can find a few, down-market portable DVD players for less than $100. 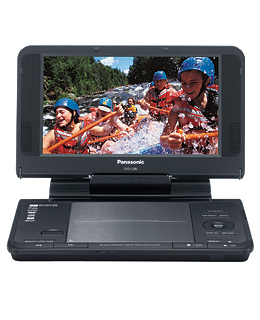 While the LS86 costs nearly twice that, the video quality is just average and the button/nav layout isn't exactly elegant, the Panasonic player has two things that make it worth the spend: it offers a big, 8.5-inch (diagonal) screen and unrivalled battery life  an SF-to-Tokyo, eye-glazing 13 hours worth of playback. (That's the claim anyway; we were able to get only about 10 hours in our tests.) Yes, some air travelers will prefer to use the battery-intensive DVD players that come standard on most laptops. But for trans-oceanic flights, and long-car trips with the kids, the LS86 is the way to go. Now all you have to worry about is packing all those blasted disks.